Balanced drawer boxes, like balanced panels, keep things simple. The following is a simplified version of the old How Wood Drawers Utilize System Holes article. Note: While the basic principles apply to all drawers, this is a fairly half-overlay/inset-flush centric article. The first thing we are going to look at is the drawer slide. We are going to look at bottom mount slides first because they clearly define the relationship between the drawer box and system holes. With bottom mount slides the drawer box sits on a ledge. The distance of the ledge, from the system hole we mount the slide to, will ultimately determine the location of our drawer face relative to system holes. We are going to call the distance between the ledge and the closest system hole the drawer slide offset (the KISS2 system calls it ride height). Different brands and styles of slides have different offsets. We can see (right) that the Hettich slide has an offset of 11mm. Some other possibilities include the Blum 230E and Blum 230M slides. Note that a full extension slide like the Blum 430E is the same as the 230E with an added intermediate rail that takes up 32mm. 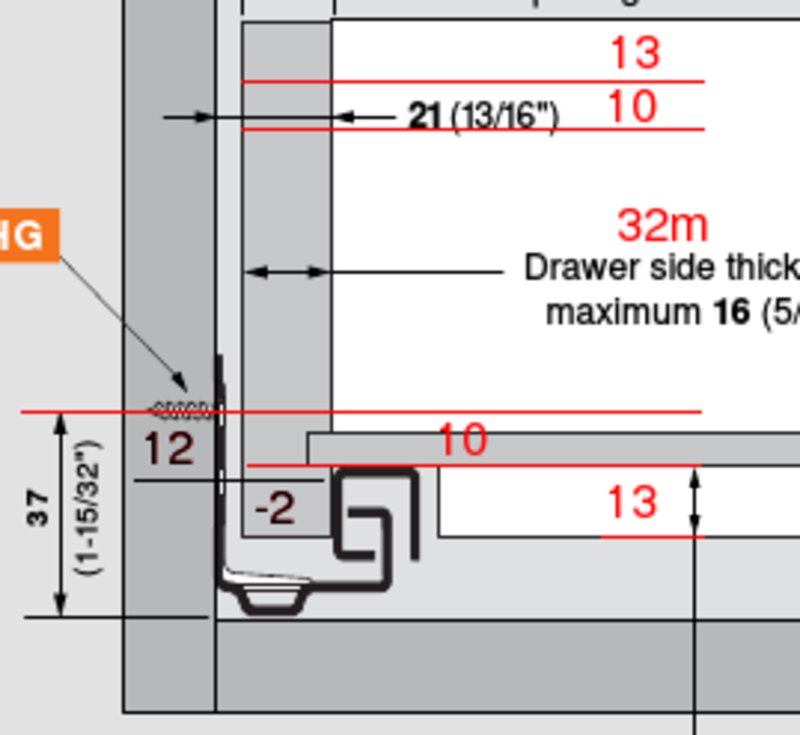 For drawer design we want to know how far the drawer box bottom will be from the closest system hole (for the 430E this is 12mm). When making cabinets its a good idea to index everything from a given point, top-front and bottom-front indexing is common. For wood drawers it is possible to center index, i.e. it works no matter how you index your cabinet components. We do this by sizing the drawer box so that it centers on the drawer face. This has a couple of immediate advantages. We can pre-drill (drawer box and face) for drawer front adjusters and pulls and we don't have to worry about which is the top or bottom edge. When setting up to drill we can rotate our pieces around to double check that our holes will really be in the center. Note: Slides with offsets less than 13mm are more system friendly. With some panel designs, slides with an offset greater than 13mm may need to be mounted 32mm higher on the panel, i.e. more wasted space. At this point I am going to keep it simple and say that our drawer box will be some increment of 32mm plus 2x our offset. The Hettich slide in the example has an 11mm offset so the drawer box is 96mm (3 x 32mm) plus 22mm (2 x 11) which equals 118mm. The drawer face and box center between system holes because they are an odd increment of 32mm (even increments center on system holes). 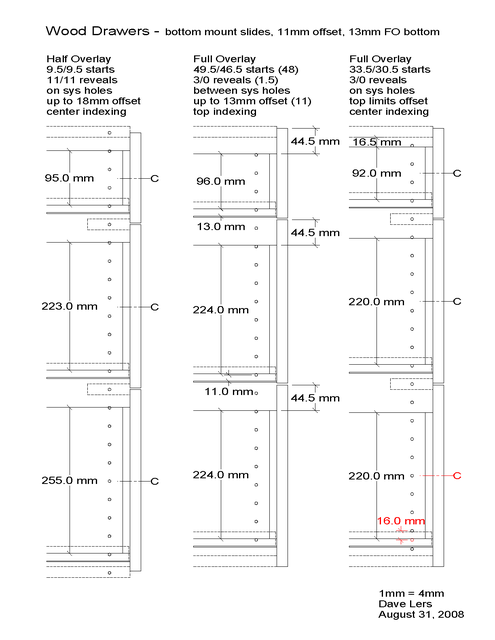 Because all drawer and door faces are in 32mm increments they will always center on or between system holes. Since our drawer boxes are all some increment of 32mm plus two times the slide offset, our faces have to be the same increment of 32mm plus 32mm top and bottom to cover the drawer box and be an increment of 32mm. For simplicity I am ignoring reveals for now. Using this method, the drawer box sub-face and the drawer face always have the same center lines. There are a number of different methods of joining the drawer face to the sub-face. Whatever method we choose, we always have a common reference point. If we will be using inset bottoms and both bottom and side mount slides, we can use the same drawer box sizes. If our drawer box sizes are based on the Hettich bottom mount slides, most side mount slides will work when we mount them 43mm from the drawer box bottom. This is 32mm plus the 11mm bottom offset we used to center the drawer box when using Hettich bottom mount slides. All we did is move the side mount slides up 32mm so they wouldn't overhang the bottom of the drawer. With bottom mount slides, bottom indexing makes the most sense. Top indexing would also work. The numbers are the same, some increment of 32mm plus the 11mm offset (75mm in this example). With side mount slides and top indexing you could mount all your slides using the same number you use for your smallest drawer (e.g. 43mm from the top). While centering the slide on the drawer box would be nice, it only works when all of the drawer faces are an even increment of 32mm. When using bottom mount slides, I prefer using drawer boxes with a full overlay bottom. With overlay bottoms we need to add one more element to the equation. To keep our center registration, between the drawer box and face, we need to subtract the drawer box bottom thickness from the slide offset. In other words, we want the drawer side offset (X). The example uses Blum 230m slides which have a 14mm offset. The example box has a 13mm (~1/2") bottom. Subtracting the bottom thickness (13mm) from the slide offset (14mm) leaves us with a side offset (X) of 1mm. The drawer sides will be some multiple of 32mm plus 2mm (the 1mm offset is added to the top and bottom of the box to keep it centered) - 98mm in the example. ...Note: This centers the drawer box face, not the drawer box as a whole, to the drawer face. Any centerline hole drilling, e.g. drawer adjuster holes, is done before the drawer box is assembled. With undermount slides the slide offset is the distance from the mounting/system hole to the top of the slide (where the box bottom sits). Here we also need the box offset which is the slide offset plus the distance from the slide top to the bottom of the box side. The later is typically a maximum 12 or 13mm (1/2" +/-). With undermount slides there are typically two rows of mounting holes spaced 12mm apart, i.e. two possible slide offsets. The two offsets are typically 9.5/10mm and -2.5/-2mm. A lower row is not always available or usable - with some slides the lower row of holes is not in line with the upper row. Add the numbers together and we get the drawer box offset. Using a 13mm overhang and a 10/-2mm slide offset (e.g. Blum 554H), the drawer box offset is 23mm (13 + 10) for top row mounting and 11mm (13 - 2) for bottom row mounting. The drawer sides will be some multiple of 32mm plus box offset x2. The example is bottom row mounted and has 118mm sides (32*3 + 2*11). It just so happens that the box sides in the first bottom mount example above were also 118mm tall. The only way the same drawer boxes can be used for bottom mount and undermount slides is if the box offset is/can be the same. Most bottom mount slides have significantly more offset than the 11mm Hettich's. ...Running the drawer box bottom through (under the front/back pieces) changes things considerably. Using the same specs as above results in drawer sides that are almost an inch shorter. Because the clips get screwed to the bottom, 12(-13)mm (~1/2") is needed. This is the first and only place I've explored this option. The slides do mount to system holes. The 37mm specification you refer to is the distance between the top row of mounting holes and the bottom the the slide, AKA Bottom Clearance (BC). When building 32mm cabinets, BC is the minimum distance that a system hole needs to be from a cabinet member. Because the 562H has a second row of mounting holes 12mm below the top row, the minimum BC is actually 25mm (37 - 12). With the example shown here, 19mm (3/4") stretches are centered between system holes and there's a slide mounting hole 38.5mm above the top of the stretchers. Here we can use the top row of mounting holes - 38.5 - 37 gives us 1.5mm of clearance between the slide bottom and stretcher. Because the bottom drawer mounting hole is only 27.5mm above the top of the cabinet bottom, the bottom slide has to be mounted using the bottom row of mounting holes. Here we have 2.5mm of clearance between the slide and box bottom (27.5 - 25). This is the Process 32 (Blum) example (which could be improved on w/ n x 32 drawer box sides). While that design works, it does not provide a consistent relationship between all drawer boxes and faces. To achieve that, all slides could to be mounted using the bottom row of slide mounting holes. Instead of 1.5mm between the bottom of the slide and stretcher, we have 13.5mm (38.5 - 25). This is the 32mm System example. See Full Overlay Undermount for system registered examples (shifted shown here), both are 562H compatible. I like how simple you use the slide offset to determine the height of the drawer box, it results the same heights of Hettich MultiTech Metal drawers program (Hettich Catalog, page 5.146) as you use Hettich example of slide runners (11mm offset), but since long time ago I can't resolve how to remove the first drawer off the cabinet if we use under-mount slides according to system 32 Balance in panels & Fronts without wasting too much cabinet space. To maintain the balance of the drawer box, all fronts & panels, what do you think is the best solution to have the minimum space wasted. If I want to start the system holes at 32 or 30,5mm from the bottom (i.e. 1.5/1.5 or 3/0 reveal) the solution is to choose the first drawer box 16 or 32mm lower loosing only here the center? If we start the system holes at 48 or 46,5 mm from the bottom, is mandatory to lower the drawer box height other 32mm to maintain the center, and resolves also the problem with the first drawer for the 4 starting points mentioned. If we maintain the drawer box height and shift all the drawers fronts 16mm down from the center of the drawer box we loose here the centered assembly of most drawers, not the first because it has to have the drawer box 32mm lower always. Drawer slides can be frustrating. The most consistent and easy to build layout often results in a lot of wasted space. As you've pointed out, top and bottom clearances as well as slide offset can make or break a layout. I came up with the center indexing layout while working with half overlay and inset cabinets. With bottom mount slides I like using 13mm stock throughout. A full overlay 13mm box bottom is easier to build and is sturdy enough to use with any drawer size and load. What I hadn't realized (or had forgotten) is that the full overlay bottom is a key factor in my center indexing method. With a full overlay bottom, adding (or subtracting) drawer bottom thickness increases (or decreases) drawer top clearance. With a 13mm full overlay drawer box bottom and the 11mm top/bottom reveal on half overlay carcases, slide offset and top/bottom clearances aren't a big deal (first example in the drawing). With the reduced face to box reveals of full overlay cabinets, drawer top/bottom clearances and slide offset are a lot more critical. Maximizing drawer space often requires that the face on the bottom drawer be extended 32mm lower than the drawers above. Doing this can significantly reduce the KISS factor. An example would be Grass Zargon slides where all mounting brackets can be bored an equal distance from the bottom of the drawer face. Extending the bottom face 32mm means that the bottom drawer face needs special treatment. What's really frustrating with the Zargon slides is that they have an almost ideal 11.5mm offset. Slides with an offset of around 11-14mm (no more, e.g. Metabox) can provide the most usable drawer space when used with shifted panels designs (all face edges center between system holes). If the Zargon brackets were at the top instead of the bottom, the plus 32mm bottom face would be a non issue. The drawing's second example shows how slides with an 11-13mm offset can place the drawer box bottom close to flush with the drawer face. A slide with a greater offset (pretty common) won't work here. With this layout you can build your drawer box however you want. The box bottom could be full overlay or inset. I drew it with a 13mm bottom and box sides that are divisible by 32mm. With this layout, all drawer faces are an equal distance from the drawer box top. I really like center indexing though. I recently built a replacement drawer box for some factory cabinets and had to re bore the drawer adjuster holes because I bored from the wrong edge the first time. With stackable full overlay cabinets (3/0 or 1.5mm reveals) the center indexing options are really limited. Center indexing for stackable full-overlay cabinets is the third example in the drawing. There's a lot of constraints and not a lot of options with this layout. The drawer bottom (13mm full overlay), slide offset (11mm), reveal (3mm) and carcase thickness (19mm) determine the clearance on the top drawer. Note (added Sept 5): The 16.5mm carcase clearance in the drawing is a bit tight. So long as the box member wheels aren't larger than 19.5mm, the counter clearance is fine. If the drawer box depth is the same as the slide length, the drawer will need to be tipped downward so that the back of the box can clear the carcase when the drawer wheels go over the carcase wheels. To increase top drawer clearances you have two options, reduce carcase material thickness or increase the face-to-panel top reveal (a good option when using built down countertops). Its doubtful you can find bottom mount slides with a lesser offset and using 16 or 19mm drawer bottoms seems silly. However, you can significantly reduce the clearance needed to remove the top drawer by using full extension slides or by making your drawer boxes shallower than the slide length. To center index the bottom drawer there are two options - use a 188mm tall box or drill slide mounting holes centered between system holes, i.e. shift the drawer box down 16mm. My preference is the later - which also works with the earlier discussed Quadro (and, undoubtedly, other) slides. A simple drill jig that straddles two system holes would do the trick. If you don't bore for pulls at the same time that you bore for drawer front adjusters (same setup, centered pulls), center indexing the bottom drawer face may not be a big deal. With the example layout (without the bottom drawer box shifted down by 16mm and with the bottom face being 32mm bigger than the one above it) you can bore the bottom face with the same setup that you used to bore the face above it (just make sure that the top edge is against the fence :-). While working on the drawing I thought of Blum's Process 32. I have yet to study it but I'm guessing the above constraints play a role in their decision to go with a 10mm top reveal and why some of their slides require an off system hole for the bottom drawer. What I don't like is that the later is some weird number. While it would be nice to have everything in 32mm increments, 16mm shifts are useful for more than the centering example above, e.g. when leg adjusters and assembly screws want to occupy the same space. ...see also: Full Overlay Bottom Clearance.